Looking for a new way to celebrate the Easter holiday with your family? Look no further than the Pacific Southwest Railway Museum! 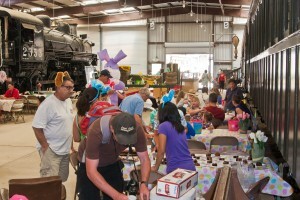 Complete with a train ride, a visit from the Easter Bunny, and an Easter egg hunt, the Bunny Train event at the Museum is perfect for the whole family. The celebration kicks off with a train ride. The Easter Bunny will board the train at the Campo Depot and visit with all of the passengers on the train before it travels through San Diego’s beautiful east-county mountains. After enjoying the 45-minute journey, the train stops at the Museum’s Display Building where more fun awaits. Two Easter egg hunting areas will be open for the children. One is geared towards our smallest travelers with eggs in plain sight; the other takes up the entire Display Building with eggs carefully hidden by the Easter Bunny. The children may turn in the plastic eggs they find to Museum volunteers for sweets and other prizes. The best part – entrance into the Display Building and both Easter egg hunts is included in the price of your train tickets! For the first time, PSRMA is offering First Class train service on the Bunny Train in 2019! Ride in our Lounge Car ATSF 1509 and enjoy a premium atmosphere, a soft drink and light snacks in addition to the great program listed above. All Trains Depart from the Campo Depot located at 750 Depot St., Campo, CA 91906. 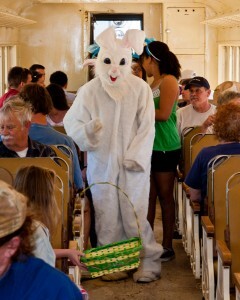 Note: Passengers arriving less than 30 minutes before their train ride are not guaranteed a visit with the Easter Bunny due to program restrictions. Cab rides are $40 per person for ages 6 and up. Persons under 6 are allowed to ride the train, but not in the locomotive. Only two cab ride spaces are available on each train. Please see the Locomotive Cab Rides page for more details.